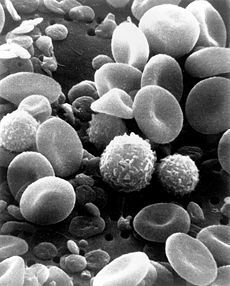 Leukocytes or white blood cells (also written leucocytes, white cell, and white blood corpuscle) are any of several types of blood cells that have a nucleus and cytoplasm and are part of the immune system, defending the body against both infectious disease and foreign materials. Leukocytes are found in tissues throughout the body, including being transported through the blood and lymphatic system. They separate into a white layer when whole blood is centrifuged. 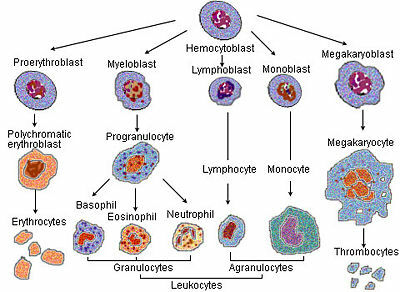 The main categories of leukocytes are granulocytes (neutrophils, basophils, eosinophils), lymphocytes (B cells, T cells, natural killer cells), and monocytes (including macrophages). These carry out a wide variety of protective functions, including producing antibodies, engulfing bacteria and protozoa, ingesting dead and infected cells and debris, and so forth. However, all of these types are produced and derived from a pluripotent cell—a cell that has the potential to differentiate into a variety of cells—in the bone marrow known as a hematopoietic stem cell. The complex coordination centering on white blood cells when the body is under attack from an infection or injury is remarkable. White blood cells are mobilized to the affected region, with the inflammatory response involving a variety of signaling molecules produced locally, chemoattractants, production by the bone marrow, and so forth (Alberts et al. 1989). All of the various white blood cell types have a different responsibility, and yet they all function together as a system in the recognizing, attacking, and destroying bacteria, viruses, cancer cells, and all substances seen as foreign. Some bacterial infections result in a selective increase of neutrophils, while infections with protozoa cause a selective increase in eosinophils (Alberts et al. 1989). All of this reflects a stunning harmony. The number of leukocytes in the blood is often an indicator of disease. In the human body, there are normally between 4×109 and 1.1×1010 white blood cells in a liter of blood, making up approximately one percent of blood in a healthy adult. In conditions such as leukemia, the number of leukocytes is higher than normal, and in leukopenia this number is much lower. The physical properties of leukocytes, such as volume, conductivity, and granularity, may change due to activation, the presence of immature cells, or the presence of malignant leukocytes in leukemia. While red blood cells and platelets (small, detached cell fragments important in repair breaches and blood clotting) are similar to one another, there are many distinct types of leukocytes (Alberts et al. 1989). Three main categories are traditionally recognized on the basis of their appearance under the light microscope—granulocytes, lymphocytes, and monocytes (Alberts et al. 1989). Division depends on whether there is the presence of granules, which allows the differentiation of cells into the categories granulocytes and agranulocytes. Granulocytes are leukocytes that are characterized by the presence of differently staining granules in their cytoplasm when viewed under light microscopy. These granules are membrane-bound enzymes that primarily act in the digestion of endocytosed particles. Granulocytes all contain numerous lysosomes and secretory vesicles (or granules) (Alberts et al. 1989). There are three classes of granulocytes, distinguished on the basis of morphology and staining properties of these organelles—neutrophils, basophils, and eosinophils. Neutrophils (or polymorphonuclear leukocytes) have multilobed nuclei, are the most common and phgocytose and destroy small organisms, especially bacteria (Alberts et al. 1989). Basophils secrete histamine (and in some species serotonin) which is important in mediating inflammatory reactions, and eosinophis help destroy parasites and impact allergic inflammatory responses (Alberts et al. 1989). Agranulocytes are leukocytes characterized by the absence of granules in their cytoplasm. Lymphocytes and monocytes belong to this category. Monocytes further mature into macrophages. Lymphocytes include both B lymphocytes (B cells), which make antibodies, and T lymphocytes (T cells), which kill virus-infected cells and regulate other white-blood cells (Alberts et al. 1989). In addition, natural killer (NK) cells are lymphocyte-like cells that kill some types of tumor cells and virus-infected cells. Monocytes mature into macrophages once they leave the bloodstream, and together with neutrophils these are the main phagocytes. Neutrophil 65% Neutrophils deal with defense against bacterial infection and other very small inflammatory processes and are usually first responders to bacterial infection; their activity and death in large numbers forms pus. Eosinophil 4% Eosinophils primarily deal with parasitic infections and an increase in them may indicate such. Basophil <1% Basophils are chiefly responsible for allergic and antigen response by releasing the chemical histamine causing inflammation. CD4+ (helper) - T cells coordinate the immune response and are important in the defense against intracellular bacteria. CD8+ cytotoxic - T cells are able to kill virus-infected and tumor cells. γδ T cells - possess an alternative T cell receptor as opposed to CD4+ and CD8+ αβ T cells and share characteristics of helper T cells, cytotoxic T cells, and natural killer cells. Monocyte 6% Monocytes share the "vacuum cleaner" (phagocytosis) function of neutrophils, but are much longer lived as they have an additional role: they present pieces of pathogens to T cells so that the pathogens may be recognized again and killed, or so that an antibody response may be mounted. Macrophage (see above) Monocytes are able to develop into the professional phagocytosing macrophage cell after they migrate from the bloodstream into the tissue and undergo differentiation. The name "white cells" derives from the fact that after centrifugation of a blood sample, the white cells are found in the Buffy coat, a thin layer of nucleated cells between the sedimented red blood cells and the blood plasma, which is typically white in color. The scientific term leukocyte directly reflects this description, derived from Greek leukos (white) and kytos (cell). Blood plasma may sometimes be green if there are large amounts of neutrophils in the sample, due to the heme-containing enzyme myeloperoxidase that they produce. Leukocytes are transported in the blood, but generally function in other tissues. In the case of an injury or infection, they can be quickly mobilized to the affected area. Some leukocytes migrate into the tissues of the body to take up a permanent residence at that location. Often these cells have specific names depending upon which tissue they settle in, such as fixed macrophages in the liver which become known as Kupffer cells. These cells still serve a role in the immune system. The production and regulation of white blood cells is keyed on the bone marrow, since most blood cells—excepting lymphocytes and some macrophages—are generated in the bone marrow (Alberts et al. 1989). Some medications can have an impact on the number and function of white blood cells. Leukopenia is the reduction in the number of white blood cells, which may affect the overall white cell count or one of the specific populations of leukocytes. For example, if the number of neutrophils is low, the condition is known as neutropenia. Likewise, low lymphocyte levels are termed lymphopenia. Medications that can cause leukopenia include clozapine, an antipsychotic medication with a rare adverse effect leading to the total absence of all granulocytes (neutrophils, basophils, eosinophils). Other medications include immunosuppressive drugs, such as sirolimus, mycophenolate mofetil, tacrolimus, and cyclosporine. Alberts, B., A. Johnson, J. Lewis, M. Raff, K. Roberts, and P. Walter. Table 22-1. Blood cells. In B. Alberts, et al., Molecular Biology of the Cell, 4th edition. New York: Garland Publishing, 2002. ISBN 0815332181. Retrieved August 24, 2007. Cassol, E., M. Alfano, P. Biswas, and G. Poli. “Monocyte-derived macrophages and myeloid cell lines as targets of HIV-1 replication and persistence.” Journal of Leukocyte Biology 80: 1018-1030, 2006.